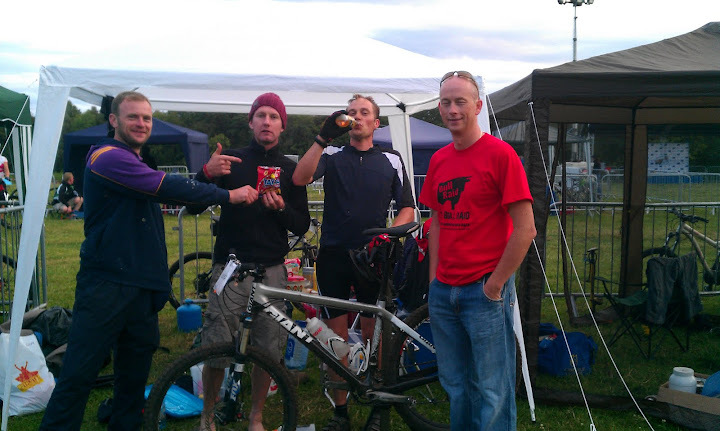 Bull Raiders, Ross, Lynn, Rudolf and DavidF share one bag of crisps and one beer. Whilst the triathletes were off in Killaloe, myself and Ross (6hr pair) Rudolf and Lynn Hayden (12hr pair) and Damian Sikora (12hr solo) headed for the Bull Raid in Bellurgan Park Co Louth. The format for these races is simple – do as many laps of the course as you can in your allocated time! Me and Ross arrived about 12ish, the lads had already been at it since 7:30. Hayden looked in a bit of a daze having already done 3 laps. Rudolf was looking fairly fresh and Damian was as usual flying around with his big happy grin. Me/Ross/Rudolf/Lynn were set up together in the pits, so there was a bit of crack and company when you were talking a rest. The course was savage – 11.1km including all of this years NPS course – so pretty technical. Started off with a lungbuster climb then into the technical stuff – tight switchbacks, rocks and roots a plenty. I was lapping average about 50 mins, Ross about 45. For us it was one lap flat out, back to the pits, crash for five minutes, get some food, change clothes, off again. Similar for the lads, with Rudolf doing a few 2 lappers. Didnt see much of Damian as he was in a different area. Conditions were good, although a good shower in the early afternoon made things a little interesting.